May reduce growth of pathogenic bacteria. Probiotic forms with strong resistance to acidity. 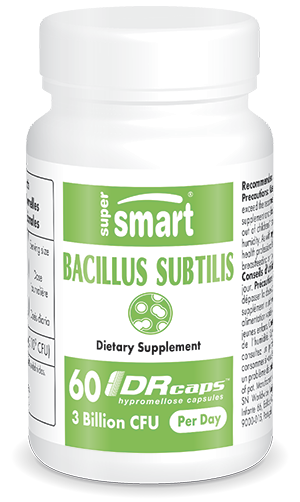 Bacillus subtilisis a specific, clinically-tested and patented strain of probiotic bacteria for improving natural defences and helping to fight infection and external aggressions. Specially selected and studied for its immunostimulant properties, this strain is listed in the Collection nationale française de cultures de microorganismes (CNCM) as no. I-2745. Pre-clinical and clinical trials have shown that taking Bacillus subtilis significantly boosts immunity in older people and protects them from winter infections in particular. • high survival rate in the GI tract and ability to activate IgA-producing cells (immunoglobulin A is a key immunity antibody) as demonstrated in vitro and in vivo in pre-clinical tests and in a clinical trial in France. • a significant decrease (-38%) in the number of days with infectious episodes and reduced likelihood of reporting infectious episodes. In view of these factors, Bacillus subtilis can be freely recommended for use by adults, especially older individuals whose immune systems are under particular stress and who may need a boost as winter approaches. This supplement can be taken in conjunction with vitamin D3, vitamin C and zinc, all of which have recognised immunostimulant properties. Other ingredients: microcrystalline cellulose, maltodextrin, magnesium stearate, silicon dioxide.